Where do local people go for the best meals at the best prices? On the eastern shore, Barbecue Inn in Lihue is a local favorite for large, tasty meals at small prices. Enjoy great Thai food at King & I in Wailua. For wonderful Mexican food, try Monico's Taqueria, and for excellent family style dinners, dont miss Kauai Pasta in Wailua. For saimin, visit Hamuras in Lihue (an island tradition). On the south shore, try Koloa Fish Market for plate lunches and great fish at reasonable prices. On the north shore, Kilauea Fish Market is a must stop for tasty fresh fish burritos and tacos, meats, and vegan delights. In Hanalei, Neidies Salsa & Samba cooks up tasty Mexican food with a Brazilian accent, and is one the best deals on Kauai! 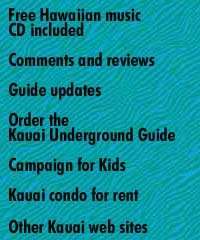 Family friendly, describes Kauai itself! On this special island, local people really love children, and many restaurants welcome families with a smile, and go the extra mile to make kids feel at home. Weve been visiting some of these restaurants for more than twenty years, and here are our all time family favorites! At the top of our family list are Hanamaulu Tea House and Brick Oven Pizza. Children will also find a special welcome at Barbecue Inn, Ono Family Restaurant, Bull Shed, Brenneckes, Tip Top, and Kauai Pasta. 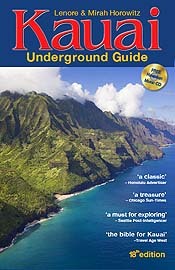 Kauai has some great dining values  if you know where to look! If you didnt know where to look for it on the side street of this small town on the south shore, you might never discover Kalaheo Steak & RIbs! Here youll enjoy steaks, prime rib and fresh island fish. Bull Shed on the easten shore is another stand out for great steaks and fresh fish, and the island's most generous prime rib, with a salad bar -- among the best value on the island! Come early to avoid a wait. Looking for a dining experience to paint a vivid memory for those cold winter evenings back home? You may find the Kauai of your dreams as you watch the sun set over Hanalei Bay from Makana Terrace in the St Regis Hotel. On the south shore, Beach House Restaurant, set right on the waves in Spouting Horn, wins the south shore award for dinner with romance. Enjoy a romantic garden setting at Plantation Garadens in Poipu. You can dine in style and enjoy memorable meals on Kauai! On the south shore, Josselin's specializes in small plates featuring the Pacific Rim cuisine of chef owner Jean Marie Josselin. Roy's Poipu Bar & Grill, Beach House Restaurant and Brennecke's are island favorites. On the north shore, enjoy Makana Terrace in the new St Regis Hotel and nearby Postcards Café for an imaginative natural cuisine using no meat ingredients or additives. Some restaurants work magic with Kauais wonderful fresh local fish. Fresh ahi, fresh ono, fresh snappers of all huesred, pink, greyare a special vacation treat, with that indescribably just-caught taste! Rather than simply charbroiled and sprinkled with paprika, these filets will be cooked to perfection with their natural flavors enhanced, rather than overwhelmed with strong sauces. For wonderful fresh fish, dont miss Brenneckes Beach Broiler on the south shore and Kilauea Fish Market on the north, and Hukilau Lanai in Wailua behind Coconut Plantation Marketplace. Youll be amazed at the wide variety of dining choices on this tiny island, only 30 miles in diameter! Pasta lovers will enjoy Pomodoro in Kalaheo, a small, informal family-owned restaurants with great food at amazingly reasonable prices.Kauai Pasta in Wailua is anothr great choice at reasonable praices. Pizza lovers will adore Brick Oven in both Kalahel (the original) and Wailua. For great Japanese food, Kintaro in Wailua makes the islands best sushi. Nearby Monico's Taqueria cooks up south of the border specialties with local ingredients and an emphasis on the healthful. On the north shore, in Hanalei, Neidies Salsa & Samba has Mex with a Brazillian flavor.